Red Nose Day returns May 23rd on NBC. Money raised during Red Nose Day will be used to fund programs that address the immediate needs of children and young people living in poverty in the U.S. and around the world. Money will be split between domestic and international poverty issues. NBC will again air a comedy special May 23th at 8 p.m. Central. Stand-up performances, sketch comedy, parodies and music performances from A-list artists will be part of the telecast. You can support the cause by buying your red nose at area Walgreens stores and get silly for a serious cause. 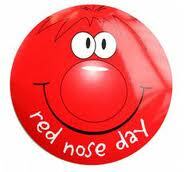 People will wear red noses in support of the official Red Nose Day on May 23. Walgreens again will be the exclusive retail partner of the second annual Red Nose Day and kicked off the campaign this week by stocking red noses at Walgreens and Duane Reade locations nationwide. The second annual campaign will expand to include the sale of new red flair merchandise, including red hats, novelty headbands, oversized sequin bowties and red noses for cars. Walgreens aims to sell more than the 5 million red noses that were purchased last year. The sale of red noses and red flair merchandise, which will cost from $1 to $6, will run through June 4 and began two weeks earlier this year. Proceeds will benefit the Red Nose Day Fund, supporting charities with domestic and international reach aimed at fighting kids’ poverty. Red Nose Day USA is run by Comic Relief, Inc., an independent sister charity of Comic Relief U.K. that changed its name from America Gives Back in November 2014. The organization did not actively solicit contributions before last year’s Red Nose Day USA but sponsored a special “America Gives Back” broadcast in 2007, as part of the hit television program “American Idol,” that raised more than $70 million for hunger relief. Walgreens kicked off this year’s campaign with actor and comedian Ravi Patel, who arrived at its flagship Chicago, Ill. location in a Red Nose Day-adorned armored truck to deliver red noses and flair. For the Red Nose Day, NBC, Walgreens and M&M’S are all partnering together. NBC is the official broadcast partner with Walgreens and M&M’S set as two of the presenting media sponsors. Walgreens is also the official retail partner for millions of Red Noses, a range of Red Nose Day “Flair” merchandise and a host of other Red Nose Day partner products.Let's enjoy this red nose day with full of fun and joy then. This is a blog about red nose day 2019. Here we will share images,wishes,games,donation etc. about red nose day 2019. Copyright © 2019 Red Nose Day 2019 All Right Reserved.